Tawag ng Tangahalan Boys Mackie Empuerto, Kiefer Sanchez & Francis Concepcion are named grand winners of Your Face Sounds Familiar Kids Season 2. 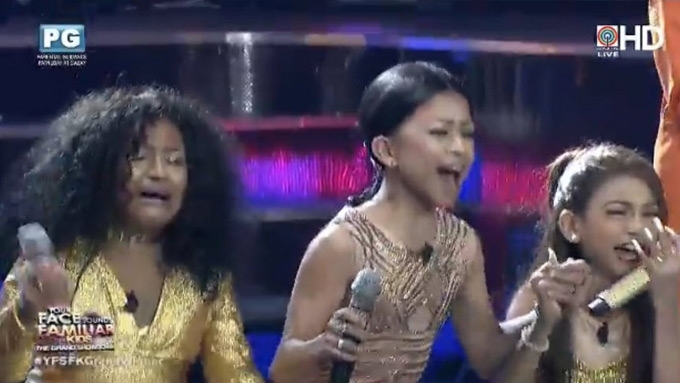 TNT Boys wins Your Face Sounds Familiar Kids Season 2! Tawag ng Tanghalan Boys Mackie Empuerto, Kiefer Sanchez, and Francis Concepcion were named the grand winners after receiving a combined percentage score of 100% from audience and judges' votes. For the grand showdown, Mackie, Kiefer, and Francis transformed into Jessie J, Nicky Minaj, and Ariana Grande to perform their own rendition of the hit dance single Bang Bang. The grand winner of Your Face Sounds Familiar Kids Season 2 receives a special gadget showcase, trophy and medal, house and lot, and PHP1 million. The grand showdown of the ABS-CBN reality singing competition was held at the UP Theatre.